I asked my friend who posted it for a source, and he gave me a link to a hemp manufacturer. I'm pretty sure it's not a reputable source. I'm interested to see if there is any independent study, patent, manufacturing process, etc, that shows this claim to be true. Thus, this quote would have pre-dated modern manufacturing techniques for paper production as well as modern tree-farming techniques. This means that this is actually a difficult question to answer in part because tree farms and traditional farming techniques are completely different from each other and modern technology means that the techniques involved have likely changed greatly in the almost 100 years since the study was conducted. To begin looking at things from a modern standpoint, tree farms typically thin a stand at 15 and 24 years with a final clear-cut harvest every 33 years (see slide 5 of 15). However, hemp can be harvested on an annual basis which puts it in line with traditional farm techniques1. This would imply that on a very simplistic level the hemp could come out ahead just because no thinning or harvest of a tree stand was done in a given year. So to give a bit more of a fair comparison we are going to need to look at aggregate data and and look at the average yield per year. As with traditional farming different stands can result in different yields and in general harvesting sawlogs is more desirable than pulpwood (which is used to produce paper) since sawlogs are more valuable and therefore more profitable. This in turn means that stands tend to be managed with maximizing the amount of sawlogs produced. Loblolly Pine - 0.9 to 2.5 tons/acre/year, although yields up to 8 tons/acre/year are also reported. The yields for hemp fiber3 on the other hand tend to be based more on historical data and tend to place the yields at 2 to 12.5 tons/acre/year with 5 tons/acre/year being the average on a good year. A modern report from a Kentucky farm put the yields at 2.8 to 6.1 metric tons/acre/year with other sites getting worse yields. Thus, to return to the original claim, if we assume that only paper production is considered (i.e. fiber production in the case of hemp and wood pulp production in the case of trees) then the claim appears to be false with hemp yields only appearing comparable to Loblolly Pine per acre/year wood pulp yields although it is possible for hemp to out produce Loblolly Pine production when it is not grown for pulpwood. However, if other trees are considered then well managed tree farms appear to greatly outproduce hemp farms in terms of per acre yields. The only way this claim is true is only if year-by-year data is examined due to the way tree farms are thinned and harvested due to the significant number of years of no production. For our purposes this is being defined as mechanically assisted farming with harvest being done at the ideal time to maximize yield. Green ton - 2,000 pounds of undried biomass material. This is also assuming the fiber is only used for paper production as opposed to other usage in clothing or rope production. Some useful timber volume-to-weight conversions. There are several reasons why hemp is not used to make paper. Biggest one is that it's more expensive. Hemp has never been used for commercial high-volume paper production due to its relatively high processing cost. The cost of hemp pulp is approximately six times that of wood pulp, mostly because of the small size and outdated equipment of the few hemp processing plants in the Western world, and because hemp is harvested once a year (during August) and needs to be stored to feed the mill the whole year through. While the wood products industry uses nearly 100% of the fiber from harvested trees, only about 25% of the dried hemp stem — the bark, called bast — contains the long, strong fibers desirable for paper production. Hemp is only harvested once per year. And the hemp need to be stored for quite a while. Storing costs together with the fact that only a small part of the hemp can be used for paper, makes hemp not overly suitable for paper, economically. In the paper they use fast growing types of wood, and get a yearly yield of between 6 and 12 tons per year per acre. Wood uses much higher efficiency converting wood to paper than hemp to paper. 1/4th vs close to 100%. Yields of wood per acre per year, is similar and sometimes more than the ones of hemp. 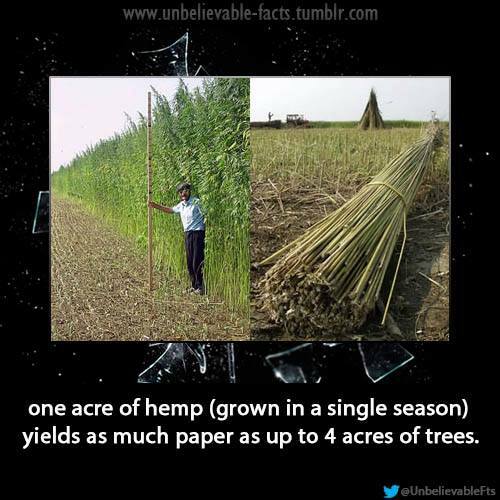 The picture is wrong, seeded forest is more efficient for paper than seeded hemp. Hemp is less efficient than wood, and doesn't give substantial better yield per acre per year, and is not as economically favorable as wood either. All in all, wood and foresting is most efficient way to gain paper, per acre.